After years of being told about The Longest Shopping Arcade in Japan, I visited the Palm Plaza, which indeed was very long. It was much like any other shopping arcade in Tokyo, which is to say it was awesome. I’ve noticed even in the few years I’ve been in Japan that these arcades have slowly been taken over by chain stores, but many of the shops remain mom and pop operations with lots of cheap stuff and more dried marine life than you can shake a chopstick at. Inexplicably, I just took a few pictures and thus I’ve got nothing of photographic interest to share. 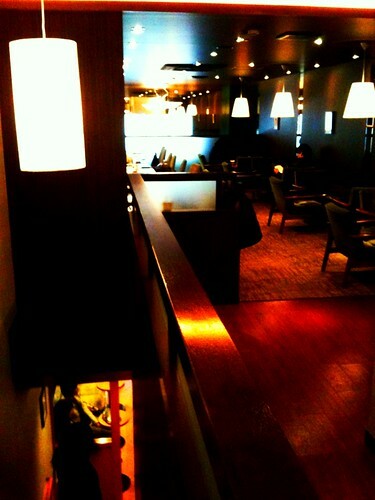 But I did find a nice cafe. I’ll now be mixing my metaphors and it won’t be pretty. Stellarstars Cafe is a tea house specializing in matcha drinks and udon dishes. Upstairs, there is a hushed library quality. There were no conversations. Nearly everyone there sat alone engrossed in a book, NOT a cell phone. This is such an unusual sight these days that I thought that I had entered into a clandestine meeting of bibliophiles. Plush seating lined each of the walls of the long room and the effect was of a monastic order poring over scrolls. When T and I bustled into this scene with a clanking tray of drinks, eyebrows were raised in our direction. I expected a stern librarian or a pious monk to come over with pursed lips. 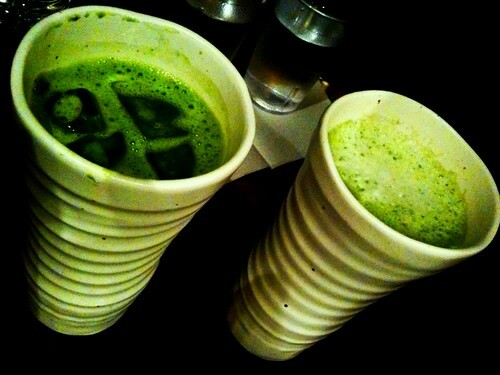 Eventually we got to drinking our teas, which was real matcha, not the sugary frothy stuff at Starbucks. The bitterness of the drinks was a tonic for contemplation. Reading something philosophical or religious would have been perfect. All I had was my iPhone and the Gospel of Facebook. Next time I’ll be sure to bring my prayer beads and a copy of the Bhagavid Gita. Or a bag of Skittles and a copy of the Tao of Pooh. That’s about as deep as I get these days. Who to bring: This cafe is strictly a solo endeavor. Suggested activities: Neatly writing biblical verses on parchment. Recommended readings: Any book that’s over 500 pages long. Two or three glued together counts. How to find it: It’s somewhere along the Palm, Musashi Koyama Station on the Meguro Line. Oh there is a very nice cake shop there too, called “The King Of Strawberry”, they serve real cheap cake meals and HUGE sundaes for 5 or 6 people – super popular with JH students! sounds like the perfect place for our next work party!